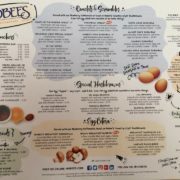 The New Year brought a major surprise to the Hobee’s faithful: a revised menu featuring over a dozen new selections and a fresh new look debuted. Customers were thrilled to find tempting new additions like the Stromboli Omelet, the Nutella Stack, Bravo Breakfast Burrito, Spaghetti Classico and the West Coast Hoagie. After rotating as wildly successful summer specials, a trio of Power Bowls also made the final cut: Guests will have a difficult time choosing from the Silicon Valley Bowl, the Teriyaki Aloha Bowl and the Southwest Power Bowl. Of course, most of your of your old favorites are still on the menu. And if you don’t find something you’ve enjoyed in the past, ask your server if the kitchen can make it for you. We have a huge list of former menu items that we call “the X Files”! We are so very sad to announce the passing of longtime Hobee’s co-owner Peter Taber. 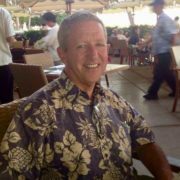 Peter died peacefully at his Los Altos Hills home yesterday after a yearlong battle with melanoma. He was 63 years old. His husband and fellow former owner, Edward Gerard Fike, was by his side. Soon after his father, Paul, opened the first Hobee’s in Mountain View in 1974, Peter decided to join the family business. His contributions are hard to overstate. Peter thrived in his various roles at the company. He served as president for nearly 20 years, overseeing Hobee’s during its peak growth phase which saw the chain expand at one point to 13 family-owned and franchised units. Peter was a talented chef and formulated some of Hobee’s most iconic recipes, including our world-famous blueberry coffeecake. During his tenure, the awards poured in: Best Breakfast, Best Brunch, Best Restaurant for Kids, Business of the Year (in six cities and our congressional district) and many more. Peter loved the people part of the business. He got to know his legion of regular customers by name and took an active interest in nurturing employees at every level. His kindness, compassion and encouragement resulted in staff loyalty quite rare in the industry. Today, a large percentage of employees celebrate one or more decades with Hobee’s. When Hobee’s was sold in June 2017 to veteran employees Camille Chijate and her husband Daniel, Peter was thrilled to witness the transition to the most qualified, capable buyers. Hobee’s carries on with Peter’s shining spirit and influence felt in every restaurant. Thank you, Peter, for your talent, grace, wisdom and friendship. We love you. We’re proud to lend a hand to vital community institutions such as PTA groups, school clubs, sports teams and non-profits. We donate 20% of all sales generated by verified attendees at these events That’s easy money for your favorite community organization! 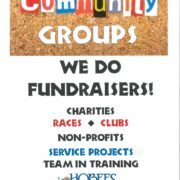 Click here to schedule your fundraiser or contact Camille Chijate at (650) 493 – 7823 x 166 or cchijate@hobees.com with any questions. 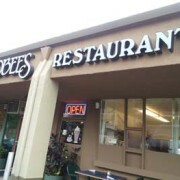 Reporter Ryan Levi was inspired when he read that the original Hobee’s owners had sold the business to two longtime employees rather than a large corporation. His interview with former Hobee’s president Edward Fike and newly-minted CEO Camille Chijate reveals what makes Hobee’s unique in the Silicon Valley’s cash-out culture. Read the article – or listen to the broadcast – by clicking here. And golden country-style hashbrowns, and orange juice. That tall blueberry coffeecake? It’s really great. Is there more? There’s always more. From gluten-free French toast to food for herbivores. “After enjoying a momentous 43 year run as the owners of Hobee’s California Restaurants, the Taber family have sold the business. Though it’s a bittersweet decision, we are heartened to leave the company in familiar, very capable hands: We proudly announce that Hobee’s new owners will be our veteran employees, the husband and wife team of Camille and Daniel Chijate (pronounced Chee-HA-tay). Camille and Daniel have each been employed by Hobee’s for 28 years. 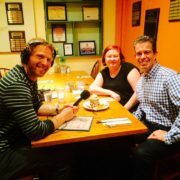 Camille presently serves as vice president and area manager, while Daniel fills the kitchen manager post at Hobee’s Palo Alto. The Chijates have earned this opportunity with their hard work and dedication throughout the years. They care deeply for our employees and customers, and have a passion for service. There is no better choice to carry on the Hobee’s legacy. As we pass the torch to the Chijates, we are overwhelmed by the vivid memories we have shared with all of you. When our late father, Paul Taber, founded Hobee’s at a tiny site in Mountain View in 1974, he had one primary objective: to make friends. With his sly sense of humor, Paul indeed made many friends. In the process, he also created one of Silicon Valley’s earliest and most enduring success stories. Throughout the years, we served up the Best Darn Breakfast in Town (and much more) to over a million customers. 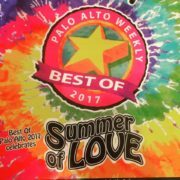 We racked up over a hundred awards, including: Best Breakfast, Best Brunch, Best Burger, Best Restaurant for Kids, Best Clam Chowder, Community Hero Award and Business of the Year in six cities and our congressional district. 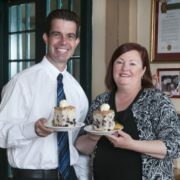 We welcomed luminaries from high tech, Hollywood and DC, and made our signature blueberry coffeecake world-famous. Our devoted employees have continually made us proud; scores have stayed with the company for more than two decades! Hobee’s has always been a family affair. With Paul’s vision in place, the rest of us – matriarch Mary Taber, son Peter, daughter Connie and Peter’s husband, Ed – found unique ways to contribute to the business. Mary cheerfully processed the company payroll until age 82, then enjoyed over a decade of retirement in Honolulu before her passing in 2014. 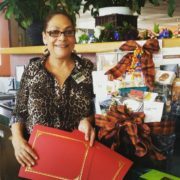 Connie focused on customer service and developed a fun, interactive training program that has been used by thousands of appreciative employees. Peter served as Hobee’s chief architect for expansion and used his superb cooking skills to develop many of Hobee’s most iconic recipes (yes, coffeecake included!). Ed, an attorney, assumed the CEO mantel from Peter and skillfully navigated the company through the economic ups and downs of the new millennium. Now, the next era will begin, and while the Taber name will no longer be attached to the business, we nevertheless feel that we have kept Hobee’s in the family. What a joy and privilege these 43 years have been! We will be forever grateful for your kindness, support and friendship. With sales records shattered at his store during the past year, and co-workers Felipe Zarate and Lety Martinez receiving big awards, we could not resist going back to Montague Expressway for our company’s biggest honor: We proudly present this year’s Paul Taber Commitment to Excellence Award to Francisco “Pancho” Ramirez, Montague’s outstanding Kitchen Manager. The Paul Taber Award is given each year to an employee who demonstrates the founder’s legendary dedication to service and quality. Pancho models Paul in so many ways: He is focused on preparing the highest quality food and takes pride in presentation and accuracy. For the past 27 years, Pancho has been a prime asset to Hobee’s kitchens in the South Bay, including Montague, San Jose / Town and Country and Pruneyard. He did not immediately become a Kitchen Manager; that took a decade more of being one of the company’s best cooks. When he finally did take the promotion to KM, Pancho shined. He used his experience to show others how to excel in their jobs. The past year has been a great year for Montague, and Pancho has been a big reason for the store’s big hike in sales. 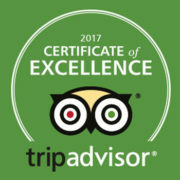 The food scores on the secret shopper reports are consistently high, and we receive comments all the time from happy Montague regulars. Pancho also maintains an enviable food cost and helps Felipe control the overall labor cost. 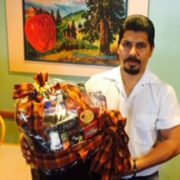 Pancho already has a terrific Achievement Awards record: He won the Outstanding Kitchen Manager Award three times (2003, 2004 and 2010). Nevertheless, it’s time to recognize his lasting contributions to Hobee’s with this major accolade. Congratulations and thank you, Pancho! Congratulations to all of this year’s winners and finalists! For a full list of winners since 1993, visit our Hobee’s Achievement Award archives. So nice to top the list of “I Love Mountain View’s” top breakfast choices. ILMV blogger Heidi Chun writes: “You can’t possibly walk out the door without eating a piece of their famous coffeecake. I love that Hobee’s is so involved in the community and they treat their employees like family. I always order the “BDBIT” (best darn breakfast in town) and 4 or 5 cups of coffee.” You can read the full post here.